The real estate that the hotel is now on was actually the first studio plot of 20th Century Fox in the early part of the century, when gas-guzzling cars were called hayburners. No joke, that's just a fun fact! 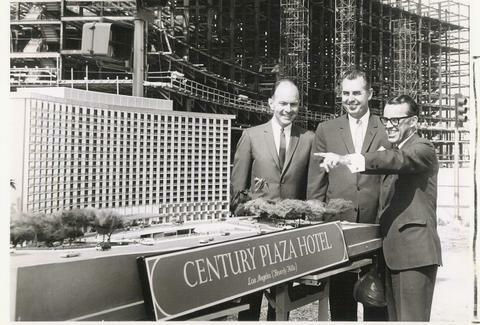 Construction started in the mid-'60s, helmed by Minoru Yamasaki, the dude who also designed the World Trade Center. Every commander-in-chief since Lyndon Johnson has stayed there at least once, with Ronald Reagan sleeping there so much it was nicknamed "White House West", though apparently no one on his team ever drove by Youngwood Court. There's a 200ft tunnel hidden under the building that connects to CAA across the street, which was originally built in the 1970s for clandestine meetings, presumably in an attempt to sign the Ninja Turtles and Bebop away from Paradigm. The ballroom's hosted performances by legends (The Supremes, Bob Hope, Elton John, Joan Jett), non-legends (John Mayer), and exclusively literal legends (John Legend). Suge Knight spends a lot of time at their drink spot XBar, so try not to order anything Vanilla, with Ice, because he'll just hold it upside down out the window until it agrees he was originally the one drinking it.